I have recently read about homemade laundry soap on several blogs that I visit and became interested in trying it out. I then searched the internet for more information and have actually combined a couple of different recipes. I was lucky enough to find all the ingredients at Wegman's and have included the prices. The entire recipe cost $11.24 which translates to less than 4 cents per load. Grate and chop the soap with a food processor, one bar at a time.Mix all ingredients together. 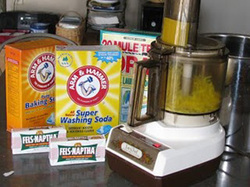 Fels Naptha is found in the laundry section of the store. After grating the soap it was not quite as fine as I wanted it so I then chopped it in the food processor until it was the consistency of coarse cornmeal. When pouring and mixing ingredients there was a fair amount of soap powder in the air so you may want to do it outside. The soap does not become sudsy in your washer. Some bloggers say they add 1/2 cup of white vinegar to the rinse cycle to soften fabric and brighten whites. The vinegar clears the last bit of soap remaining on your clothes and there really was no vinegar smell left on the clothes. I still used a dryer sheet to eliminate static cling.